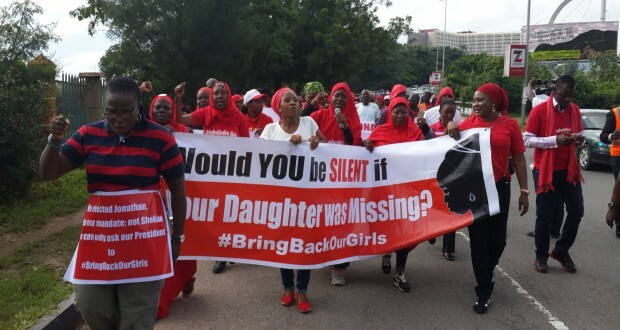 In furtherance of the #BringBackOurGirls advocacy group’s Global Week of Action to mark 180 days of the 219 Chibok schoolgirls’ abduction, the group will today march on the Presidential Villa, Abuja, to express the urgency of the abducted girls’ rescue. The group in a press statement yesterday, said it has requested for an appointment with President Goodluck Jonathan, adding that it wants to hear directly from him the latest effort to rescue the girls who have being held for six months by Boko Haram insurgents. “The objective of our march to the Villa is to convey the urgency of the rescue of our girls and to hear directly from our president and commander-in-chief of our armed forces the accurate status of the rescue effort of our Chibok girls, whose six months period in captivity remains a source of deep anguish to their parents, Nigerians and people all over the world who believe in our shared humanity. “The last 180 days have been days of dashed hopes, intense pain, and confusion for the families due to the lack of accurate information from the government on the current status of the rescue operation. “The march will be joined by some of the parents of the abducted girls as we continue to stand in solidarity with the abducted 219 girls and their families”, it said. Meanwhile, the BBOG group has revealed that it is partnering with American singer, Alicia Key’s ‘We Are Here’ movement to help in the advocacy for the return of the abducted girls. Speaking recently during the group’s sit-out, one of the co-conveners of the group, Dr Oby Ezekwesili, stated that strategic alliance with international bodies to advance the cause of the girls has become imperative to create global awareness to force action from the appropriate quarters. “Our 219 Chibok girls did not obviously offer themselves to be abducted, however in a dramatic twist they now have found more empathy in foreign lands than they have found at home. This is not to undermine our own efforts back home to sustain this advocacy. Alicia Keys for instance, an American born singer and an activist have vowed to remain a strategic partner on the issue of our Chibok Girls”, she said.